I must be just the sort of customer Apple love, I think. Having had fun playing with iMovie, I long ago upgraded to Final Cut Express, and I’m a big fan of Aperture, their offering for those who need more than iPhoto. This week I decided to splash out on Logic Studio, which is a substantial upgrade from GarageBand, and I’m looking forward to getting to grips with it. A key part of the decision was that it includes Soundtrack Pro which is an exceedingly powerful audio editor/mixer and has good facilities for creating video soundtracks. The package isn’t cheap, but some of the individual components used to cost substantially more on their own in the not-too-distant past. And hey, who knows when I might have to mix a 5.1-surround soundtrack to my home movies! One thing was clear, though, I really needed to replace my miscellaneous cheap mic pre-amps, phantom power units etc with a better audio interface if I were to make the most of Logic. The default manufacturer of such kit for amateurs like me is usually M-Audio – I have some other bits from them, and their Fasttrack Pro USB interface was recommended on Gear Media Tech. But USB is almost always an inferior technology to Firewire, especially if you’re concerned about latencies or the number of channels. 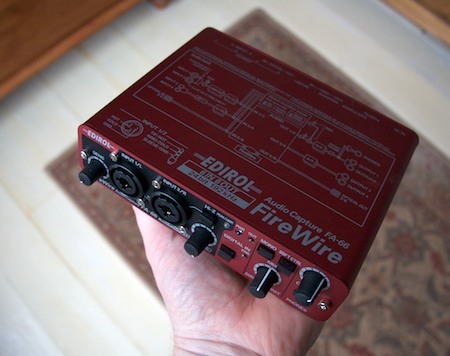 It’s something PC owners often have to live with, but Macs all have Firewire, so I thought about the M-Audio Firewire 410, which you can buy from the Apple Store or, at nearly half the price, from StudioSpares. However, as I read up on this, people seemed divided on whether M-Audio are good value for money, or just cheap, and in addition, they had taken a very long time coming up with Leopard drivers for the 410. On my first quick experiments, I’m very pleased. It does everything I wanted and more. All I need now is some talent to go with it!